“Space is big. Really big. Owning a small telescope can give a lot of pleasure, but it’s often a struggle trying to locate specific objects in the night sky. In this project I made and integrated an Arduino-powered star-finder with a small reflecting telescope, to allow me to easily find the galaxies, nebulae and clusters that I wanted to observe. What: This device calculates the current position in the night sky of a list of galaxies, nebulae and star clusters. It then measures the current heading and elevation of the telescope, and displays to the user how to orientate their telescope so that the chosen target object will be visible. The electronics are all contained within a convenient handset, attached to the telescope mount on a 0.5m cable. Why: Traditional methods of finding objects in the night sky (using charts, maps, following constellations) are slow and require experience, and motorised ‘Go-To’ telescopes are very expensive. This project finds a happy medium between the two. Clear night skies are not common, so using this Arduino star-finder allows you to make the most of your precious viewing time. How: The Arduino receives position and time data from a small GPS module. Using this, and known coordinates for a list of objects (my initial code includes 45 astronomical objects, and it’s easy to expand this list if you choose), their current position in the night sky (relative to the observer) is calculated. The name, position and type of the current chosen object are displayed on a small LCD screen on the handset. By using a rocker switch, the observer can choose which of the database’s objects to observe. The heading and elevation of the telescope are measured using potentiometers. 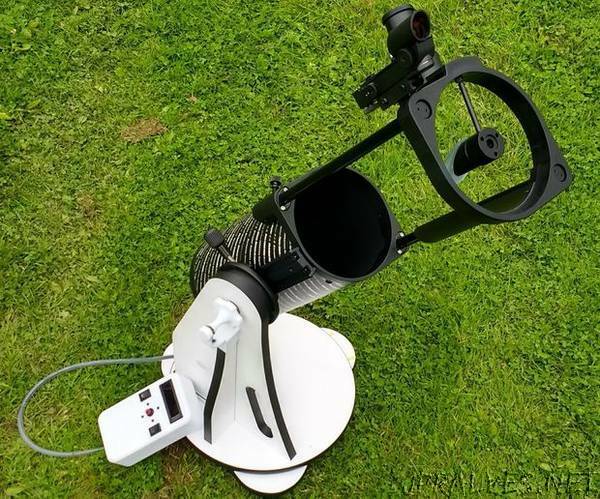 The Arduino then compares the position of the target object to the orientation of the telescope, and using LEDs on the handset indicates to the user whether the telescope must be moved up, down, left or right. When the target object is within the field of view, all four LEDs will illuminate. At this point the observer may view the target object through the telescope. The program constantly updates the position information, to assist the observer in tracking the target object as it moves across the night sky. I used a 3D printer to create fittings to house the potentiometers, and to make the handset and battery box holder. Please note: this project assumes some prior experience with Arduino, basic amateur electronics, 3D printing and CAD (possibly). I’ve tried to cover all of the background information relating to the astronomy, and justifications about why I designed it how I did. To avoid creating an overly wordy Instructable I’ve therefore left out some minutiae of the project that would be tedious, for instance wiring of LEDs and switches etc. If there’s anything that confuses you, please ask a question and I’ll try and answer. Also don’t forget that the wonderful thing about Arduino is the huge level of online support, so if you’ve got a question, however basic, hopefully you’ll quickly find an answer online too. This is also my first Instructable, so please go easy on me!